The hotel is situated at peak of the Darjeeling. Thought it takes time to reach the hotel, the location offers splendid view. The rooms are very spacious, clean and well maintained. We stayed here, just after marriage, on our honeymoon trip. The room was too large with a separate dining Area and a Fireplace. Food was good. Warm water and fireplace services were prompt. The hotel provides you the pick and drop facility to the Darjeeling main city as well. Overall a splendid experience for connecting back to each other. 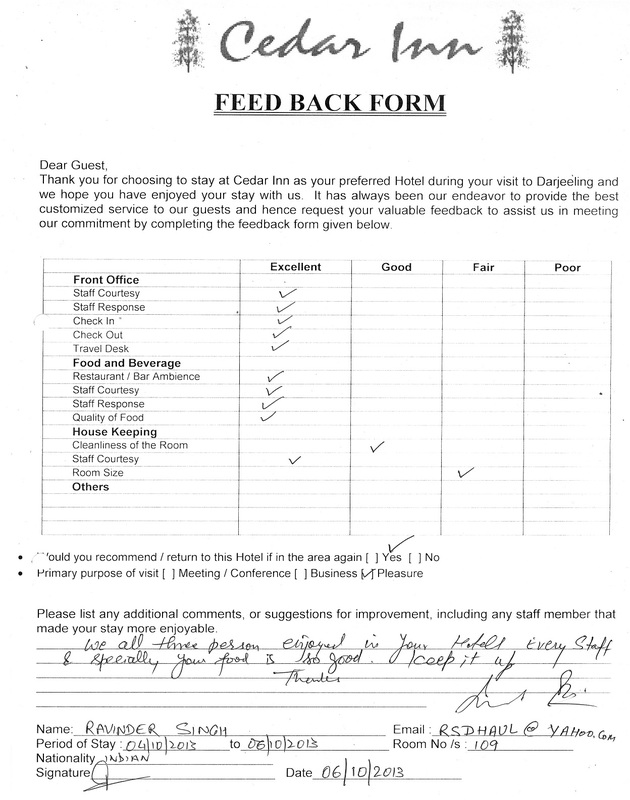 I stayed at Cedar Inn for about 5 days in the months of May 2013 and as it turned out it was a fantabulous place. Amit assisted me in getting the bookings done as advance booking is always advisable when you are visiting Darjeeling. We were travelling from Bagdogra and the airport pickup, and drop at the end of our trip, was promptly arranged by the Hotel. Room, we stayed in, had an awesome view and thankfully out of the five days we had a day where we were able to see Kanchenjunga from our room. We were impressed by the way Hotel was constructed and cleanliness impressed us. Also the Hotel staff was always similing and was very helping. The only letdown, throughout our entire stay, was food. The non-veg dishes were still sort of okay but the veggies were completely tasteless. I stayed in Hotel Cedar Inn in 2006 with a group from Australia. This was my second visit for three nights in May 2013 with another group.It was wonderful to see the familiar friendly staff, same charm and beautyof the place.Magnificent location of the hotel, its coziness, warmth,colonial ambience, beautiful garden immediately made us feel very welcome. Everything from the spacious rooms with a view, delicious food, services with a smile, housekeeping were excellent particularly the hot water botttle tucked into the bed in the evening. I enjoyed my morning walks to the nearby Japanese Budhist Peace Pagoda, St.Paul’s School amidst the coniferous forest and alluring mist- very tranquil and peaceful! Don’t forget your walking shoes! I will highly recommend this beautiful hotel to my friends who are already plaaning to return here with their family.